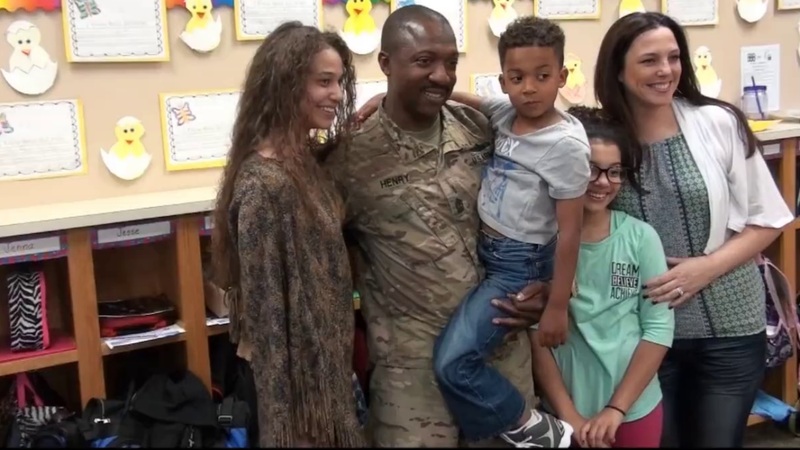 MANCHESTER TOWNSHIP, NJ -- A soldier received a little help from his local police department Thursday to surprise his three children at school. U.S. Army Sgt. Major Harrington Henry and officers with the Manchester Township Police Department first surprised 16-year-old Amaris, a sophomore at Manchester Township High School. Henry's oldest child had no idea her father would walk into the room during what she thought was simply a safety demonstration from the uniformed officers. Next up were Henry's two younger children -- Loghan, a 4th-grader, and Aaron, a kindergartner, at Manchester Township Elementary School. Henry spent the last nine months deployed in Iraq, helping the Iraqi Army in their fight against ISIS.